“Come hungry” to this West Loop “king of breakfast”, a “quintessential” “Chicago icon” since 1923 where “oversized” portions of “hearty”, “high-quality” diner fare like “lighter-than-air scrambled eggs” and “amazing French toast” are served all day by “friendly” staffers who “have been working there for 20 years or more”; the “old-time” environs can be “crowded”, so “get there early to avoid the lines” – though some late risers are “treated to donut holes and Milk Duds” while they wait. 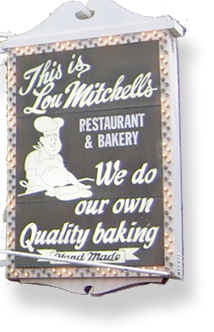 Lou Mitchell’s was inducted into the Route 66 Hall of Fame on June 8, 2002. Lou Mitchell’s, established along Route 66 when the fabled road was a key transportation link between the Midwest and California, was added to the National Register of Historical Places in May 2006. At the top of Chicago's list of beloved names is Lou Mitchell. This eponymous diner is by no means an elegant affair, but thanks to its delicious omelets and iconic crowd, it has been on the Windy City's must-eat list since 1923. Don't panic at the length of the lines: they are long but move fast, and free doughnut holes (one of the restaurant's signature baked goods) make the wait go faster. Back to those omelets: they may be made with mere eggs, like everyone else's, but somehow these are lighter and fluffier, almost like a soufflé, stuffed with feta, spinach, onions, or any other ingredients of your choice. They arrive in skillets with an Idaho-sized helping of potatoes. The best part? Everyone gets a swirl of soft-serve at the meal's end. "It's always nice to have a donut hole while waiting in line to be seated. It was pretty busy around noon-ish Sunday. Seating arrangements were tight with 5 people. Breakfast was good but more expensive than your typical suburban joints. Breakfast for 5 people was just under $100. What I liked most was that they ring the bell to get everyone's attention. We all sang happy birthday to some guy named Don and said thank you to two sailors from Great Lakes NTC. I also like the slice of a good orange and a fig that was included. They take credit cards and you pay at the counter. Get there early if you want pastries, they go quick." "Good, hot coffee, lots of great food and warm hospitality. How can it get better?" "Challenge of the day: use one word to describe this restaurant. Easy - my answer is 'iconic'." "They are super delicious--I can't *not* order the Michigan Apples and Cheddar Omelette, the combination of sweet and salty is just too delicious." "I got the malted waffle with bacon in it. Wow. I devoured that in record time." "My omelette was excellent and my wife's eggs were perfect. " "Quite literally the best simple cup of coffee I've ever had! " "This diner is unique and classic and a must try in Chicago!" "Portions: Oh.mah.gah. Gibundis. SIX sausage links. Omelettes made from SIX eggs." "Huge portions served with brilliance and great flavor." "This place has been a long family favorite, and it never disappoints! If you go on a weekend, expect a line, but it's well worth the wait." "This place is what it must have felt like to eat out in the 60's. It's a kitschy homage to a bygone era where everything is fresh, service is friendly and there is still attention to the little details." "Everything was phenomenal from the food to the speedy service." We have earned the 2015 Certificate of Excellence based on consistently excellent user reviews.